Going to the grocery store can be a chore, but it can also hold a number of learning opportunities for children of all ages. Grocery store learning includes using money and budgeting skills, promoting knowledge of food groups and practicing reading and writing. Write out your list, naming off the items as you go. Provide your child with the latest grocery circular, a pair of safety scissors, some glue and a piece of paper. Then, read off your list one item at a time, asking your child to find a picture of that item. Have him cut it out and glue it to his paper. Repeat with as many items on your list as you think he can handle. When he is finished, his pictures should match your written list. Give your child a pencil and a piece of paper. Name off what you need to buy at the store and ask him to write those items down. Younger children are more likely to use inventive spelling, which means you’ll need to write your own version of the list, but older children should do pretty well creating a legible grocery list. To make a grocery list this way, you’ll have to already have done some meal planning for the week, with or without your child. Once you know what you’ll be cooking, give your child copies of the recipes. Ask him to look around the house to see what you have in stock and determine what you’ll need to buy. Then, have him make a grocery list based on his findings. Estimation, too, can be done in many different ways. You can have your child estimate how much a bunch of bananas weighs or how much they will cost based on the weight and price per pound. Or your younger child can estimate how many items you have in the cart. There are also ways to bring estimation into the equation before you even leave your house. Give your child a copy of your grocery list. Begin by having him write down an estimation of how much each item will cost. Allow him to take a pencil and his list into the store to write down the real cost of each item to see how close his estimate was. Questions to ask for estimating: How close were your guesses? What items did you estimate better than others? Why do you think you were so close/so far from the correct answer? The grocery store scavenger hunt is one of my favorite grocery store learning activities because it can be modified for so many different age and knowledge levels. Here are just a few ways to run your hunt. Challenge your child to find a number of different items that match the colors in a basic 8-pack of crayons (red, blue, yellow, green, orange, black, brown, purple). Older children can be challenged to find more unusual and hard-to-find colors like "magenta" or "vermillion." Though this type of hunt is geared more toward children who are working on kindergarten readiness skills, it can also be used with older children who are beginning to learn to identify geometric shapes. This type of hunt may require some pre-teaching to talk about the different food groups and what to choose to build a healthy meal. 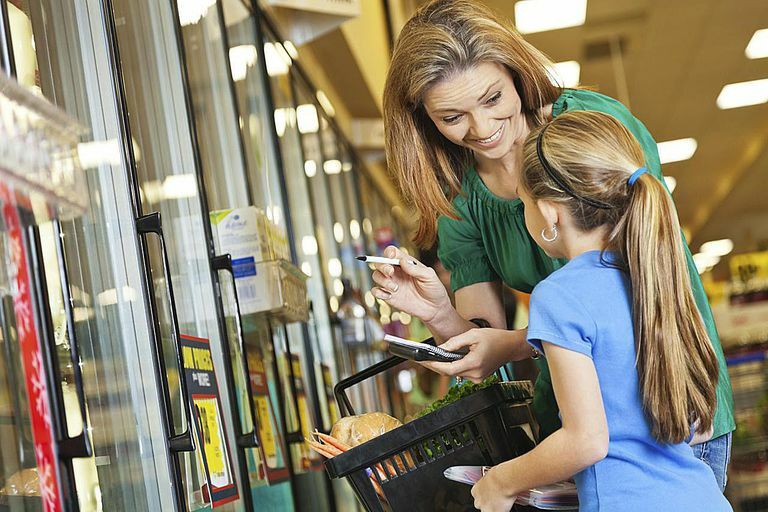 Once your child has a good sense of what foods fall into each group you can bring them to the store with you. It has a section for fruits, vegetables, grains, and protein and asks your child to find, write and/or draw four of each type of food.